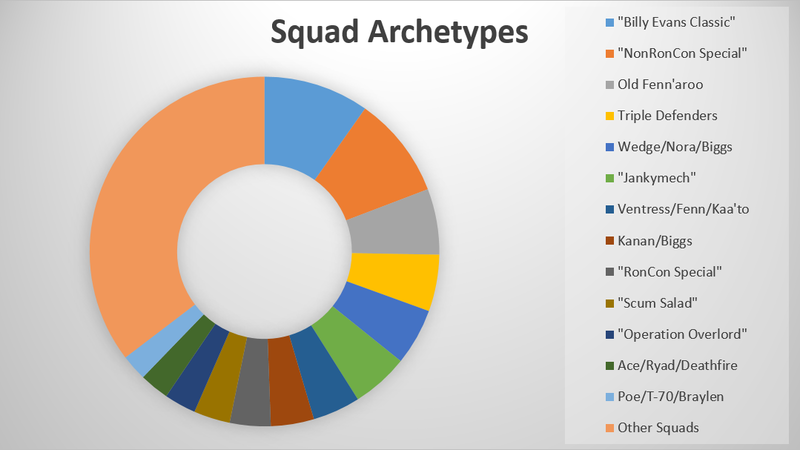 Yes, another chart with some squads in code names. Those will be spoiled during the second day of the X-Wing qualifiers, though you can probably figure some of them out on your own. 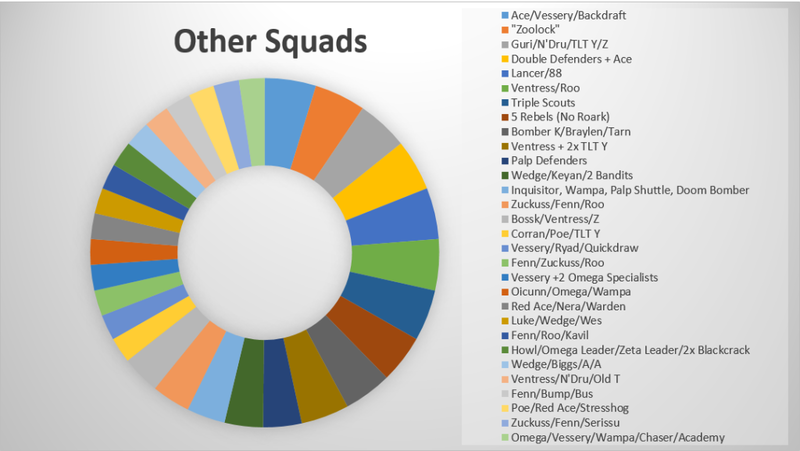 There are 43 squads in the meta with winning records right now (in 8 tournaments since the release of Wave 9), and of those only 7 are in the Worlds Prep Black Box. The remaining 34 have been disclosed (and note that some codenamed squads may overlap with disclosed squads if flown by multiple people). What’s the takeaway? If you’re prepping to go against just a couple big meta squads or obsessing over what the Howard Bros are flying, you’re probably going to have a bad time. The weird stuff far outweighs the squads that have been getting the most attention, and I don’t just mean the “Other Squads” category. I don’t think I’ve seen people mention the Wedge/Nora/Biggs combo, and most people can’t even remember what Kaa’to even does, but combined those two squads are dead even with the dreaded Billy Evans Classic. At the Curio Cavern Fall Championship this Sunday, in 8 rounds I only faced popular meta squads twice (Paul Heaver, both times). All the other matches required a lot of on-the-fly threat analysis and planning. The reason those weird squads do so well (despite getting labeled non-viable) is because their owners have flown them probably dozens of times while it’s your first time seeing it in action. When you finally figure it out 25 minutes into a match, it’s often too late.